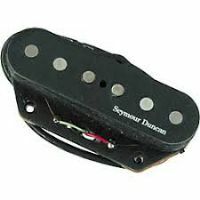 The Seymour Duncan SH-2b is a classic moderate output humbucker, especially popular for jazz players. Don't let the name fool you; it's not only great for jazz, but also country, blues, funk, classic rock and heavy rock. The Seymour Duncan SH-4 JB has been the archetype hot-rodded humbucker for over 30 years. Great for everything from heavy blues to heavy metal. The SH-4 JB is the world's most popular humbucker. 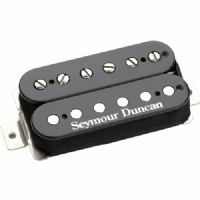 The Seymour Duncan SH-6b is a high output humbucker built for aggressive playing styles. Recommended for old school metal, nu-metal, gothic, garage, punk, thrash and other heavy rock styles. Great for drop tunings. The maple SA-3HC Woody Hum Cancelling Steel String Acoustic Guitar Pickup from Seymour Duncan is an instant-mounting, passive, noiseless, magnetic soundhole pickup that delivers a warm, rich acoustic tone. The Vintage Rails is a single coil sized humbucker with a unique split-blade design that is meant to be wired in parallel to give you a sparkly, vintage style single coil tone that is noiseless.